Oh Doggie! Dinner… my favorite! Change that… “FOOD” my most favorite! The morning nap, the afternoon snooze and sleeping all night next to my human…..my favorite! But the thing I look forward to the most is a nice car ride….especially when I get to be in the front seat where I can hang out the window…. I get to be with my human mom, see the world, and smell all kinds of delicious smells— was that a burger that just went by??!! Oh look that dog has to walk ….I get to ride…..with the wind blowing on my face and keeping me cool!! The other day we went to one of my favorite places to visit…. Precision Tune in Edina on 54th & France! Precision Tune makes sure ScoopyPoo’s Scoopers can get to everyone’s yard so they can doo what they doo best. Oh Doggie….those guys are lucky! 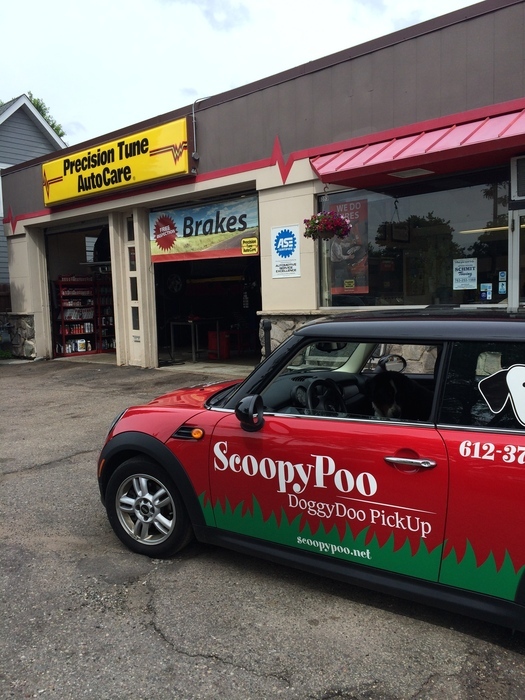 Scoopers get to ride in the Mini sCoopers all time….of course I make them give a treat before they leave! 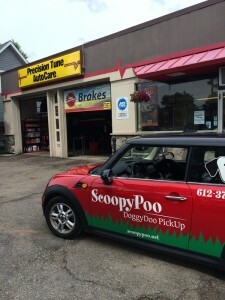 I got to go along with my human mom this time…..the Mini sCooper needed new wheels so they could go round and round and make the sCooper go! Rob, the manager, is so nice to me. He gives me treats, lets me nap on their cold tile floor, and one time I even got to go on a different car ride! I rode the car up instead of forward. But I don’t remember that part, because I was napping. Precision Tune maintains all of our Mini sCoopers, including the wheels and tires. They are fast, provide a great value, and – best of all – they are friendly to all dogs! Be sure to tell Rob “Bode sent you” – because then maybe he’ll give me an extra treat the next time I stop in!